Fr. Bill Minkel, OFM (left) board member, Marianne Kulikov, development director, (middle) and Fr. 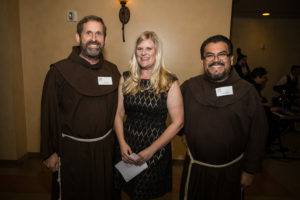 Martin Ibarra, OFM (right) at the 2017 Friends of St. Francis Center Event at the Cathedral of Our Lady of the Angels, Los Angeles. My name is Bill Minkel and I am a Franciscan friar and have been on St. Francis Center’s board of directors for a year now! I grew up in San Francisco and worked 20 years as a police officer in that city, so I am aware of the challenges people living in the “inner city” face. Those who find themselves living on the street or struggling to get by on a meager income appreciate any help they can find. That is why St. Francis Center and other similar agencies are so important. As we approach Lent, we become mindful of our own comforts and maybe even some of the excesses in our lives. We consider the less fortunate. We should be consoled that our faith teaches us that God has a special love for those who have fallen on hard times. Service agencies like St. Francis Center help to convey that loving care. The staff and volunteers are the people who make the care real – they are the leaders who live out the feeding of the hungry, the clothing of the needy and the concern for those sometimes forgotten. Though my full-time ministry is done in Arizona on the San Solano Missions Indian Reservation, I have helped at St. Francis Center on occasion. I have enjoyed seeing Francis’ spirit on display, which is evident in the way those who serve take time to listen and share with those who come to St. Francis Center. Relationship is at the heart of Franciscan life! Someone once told me that most people who are homeless just want to be regarded – looked at with respect. That is what they hunger for, that is what they are really asking for, not so much for spare change. As a board member, I am also aware of the important role our donors play. The Center would not be able to continue without them! Lent is a time when we prepare our hearts to take in, yet again, the great gift of Love. We reflect on a Creator that made us all from love and for love. We also strive to believe with greater conviction that we live beyond this earthly realm. This faith gives meaning to our daily lives. It is not for selfish gain but quite the opposite, to share and help in ways we are able. May God Bless you and your family this Holy Season and may you continue to be a blessing for others. This Lent, as you enter into prayer and reflection to become closer to God, will you keep our homeless brothers and sisters in mind? Help give them hope and nourish their spirits by donating to our Homeless Well-Being Program today! $70 to feed a homeless individual for one month. $260 to feed breakfast to 225 homeless individuals for a day. SFC Partner Spotlight ~ Vox Network Solutions! SFC’S Volunteer Spotlight ~ Lou!